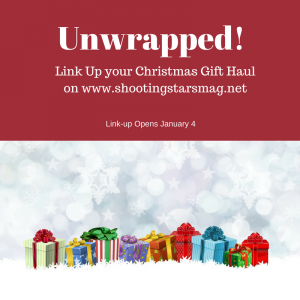 Welcome to the Unwrapped Link-Up! This is where you share your Christmas (or other Holiday) gift haul. If you want to share what you gave people, that’s fine too, but I know a lot of people will probably use this to share the items they were lucky to receive. Give a public thanks to the people who gave you fantastic gifts, and for those reading your posts, they might get ideas to use their holiday cash/gift cards on! I’ll probably do another post before the end of January (when the link-up closes – so link up whenever you can this month!) so that this one isn’t too cluttered by all the fabulous gifts I was given. However, I didn’t want to leave it blank either so I thought I’d share this photo that I posted on Instagram of the lovely gift box Sara from Stranded in Chaos sent me for the holidays. It was such a sweet box full of awesome items, and I can’t thank Sara enough (and your own box should be there later this week, Sara!) Bloggy friends are sometimes the best, don’t you agree? Again, I’ll do another post talking about the other fantastic items that I got for Christmas (I have some good friends and family) later this month, but for now, I want to turn the floor over to you all and let you link up your own hauls! Feel free to link up a blog post, a tweet, or an Instagram (or any other social media post – just be sure your accounts aren’t private so we can all Ooh and Ahh over your fun items!). If you can, use the image at the top and link back to my blog so your readers can find these other posts! you got some amazing stuff this christmas. Happy new year. Great stuff! I NEED that brownie mix! It sounds delicious! Happy New Year! Great goodies! I got an Instant Pot and am having so much fun with it. Ohh nice gifts! Socks are my favorite things ever to get! I got a lot of sweaters which is what I needed for my growing baby bump this winter! That brownie mix tho! Looks soo good! I’ll basically eat anything with salted caramel in/on it! Ohhh great haul 🙂 Coffee mugs and socks are always a hit. I got three mugs this year and I love them! That brownie mix sounds ahmazing! I love the box you received from Sara, the socks are so cute! The brownie mix sounds delicious too, you’ll have to report back when you make them! Bloggy friends most definitely are the best! What a great Christmas haul. I always love a cute mug. Those brownies sound mouth watering good! This is a fun post and I love to see what others got for Christmas. I shared a couple of fun blog packages I received in an older post! I always love receiving a new mug and that brownie mix looks DELICIOUS! Awww, I love love love these kinds of posts, and sounds as though you received some incredible items this year for Christmas! Blog friends are the best friends, eh? Looks like Sarah gifted you some incredible items! Oh So fun! My husband and I decided to go on a trip as out gift to each other, but we aren’t sure where to go yet. Fun times ahead! Nice haul, Lauren! I love the socks 😛 I’m always up for a new pair. I was quite spoiled this year by my hubs. Lots of wine and some beads that I’ve been coveting. I gave him the link to the beads though, cuz a girl’s gotta drop hints. Haha. This looks like a fun link-up. Looks like a great package. I especially like the socks! This is such a fun gift! I love the idea of a link-up like this! My favorite gift was my brand new Roomba. Helloooooooo clean floors!! Awesome! I love the mix of items she included in this for you. Very cool! She really hooked you up. Those are great!